Dallas — LandDesign continues to solidify its presence in the Dallas-Fort Worth metroplex with two key award nominations for Offices at The Realm, a mixed-use development in Lewisville, Texas, by developer Bright Realty. Planned and conceived with an expansive park and outdoor entertainment spaces, this first phase of The Realm has been named a finalist in both D CEO Magazine’s Commercial Real Estate Awards and the Dallas Business Journal’s Best Real Estate Deals of 2018 Awards, two of the regions most touted honors for new developments. Offices at The Realm, which broke ground last summer, integrates a nine-story building with 235,000 square feet of Class AA office space, 15,000 square feet for a first-floor restaurant and retail amenities, along with Crescent Park — a new public space and outdoor entertainment venue. The work for Bright Realty reflects LandDesign’s ability to design and create meaningful outdoor spaces for successful master-planned communities with varied uses and appealing, enduring public realms. For The Realm, LandDesign is working with a team of collaborators including design architect and interior designer 505Design, the office and multifamily architect BOKA Powell, and the general contractors Hill & Wilkinson and Andres Construction. LandDesign’s involvement as the project’s planner, landscape architect and civil engineer highlights the firm’s strength in providing integrated services and their leadership in master-planned communities. The nominations come at a time when LandDesign is growing nationwide, expanding its footprint into three new U.S. markets in the last five years, according to Rhett Crocker, LandDesign’s president. 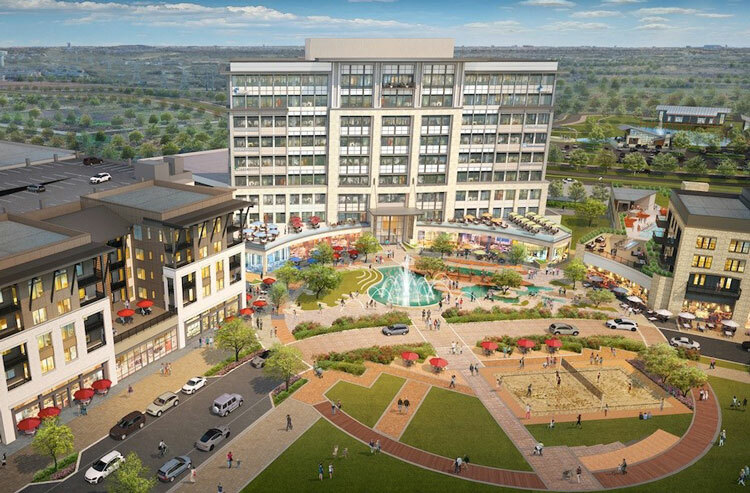 Now growing its 16-person-strong office in Texas, LandDesign has announced a number of new projects including lifestyle retail centers, master-planned communites, office parks and recreation spaces in and around Dallas. D CEO’s Commercial Real Estate Awards brings together the real estate industry’s most influential players for its premier award event of the year. Offices at the Realm has been nominated as best new office development in the “Projects & Deals” category. This year’s awards, hosted by D Magazine and D CEO, will be held on March 28th at Gilley’s Dallas. The 27th annual Best Real Estate Deals of 2018 Awards, hosted by the Dallas Business Journal, will take place on April 9th at the Ritz-Carlton Dallas and honor the best commercial real estate investments and transactions consummated last year. The Realm at Castle Hills is nominated in the category of best mixed-use development.